Recover from your injuries faster by turning to Kennedy Rehabilitation. 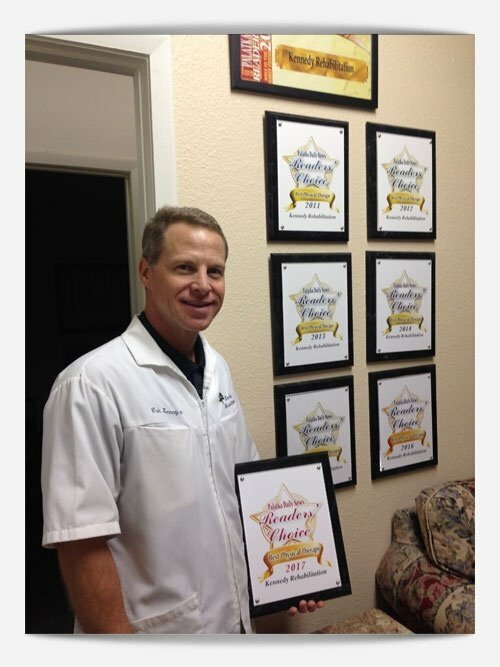 Privately owned and operated by Cris Kennedy, RPT, we are a licensed and certified local outpatient physical therapy facility in Palatka, FL that offers a hands-on approach and comprehensive treatment for various injuries and dysfunctions, such as arthritis, stroke, and joint pains. We have been providing one-on-one, personalized outpatient rehabilitation services since 1997, and have received the “Readers Choice Award” for best physical therapy practice for 8 years in a row. Cris Kennedy, RPT has more than 20 years’ experience in the industry. Working with your referring physician, he will discuss your personal goals for therapy, assess your dysfunction, and design a complete outpatient rehabilitation program that is tailored to meet your particular health requirements. Mr. Kennedy can also create a home routine to prevent re-injury and maintain your goals. Choose him to provide the physical therapy you need today, and rest easy knowing that all of your requirements are well taken care of. Choose Kennedy Rehabilitation to provide the outstanding physical therapy you deserve. We have what it takes to help you get back to your prime health. Should you have any concerns regarding the outpatient services we offer, feel free to give us a call or send us a message using the contact details featured on this website. Cris Kennedy, RPT is always available to answer any questions you might have. We hope to hear from you soon!